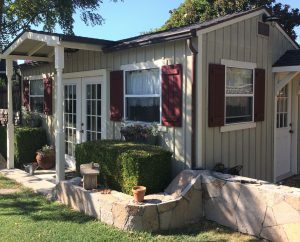 Accessory Dwelling Units (ADUs), also commonly known as in-law units, granny flats, or secondary units, can play an important role in adding cost-effective affordable rental housing, as well as providing a source of income for homeowners. Consistent with recent State laws, the City of Sonoma has updated its regulations to facilitate construction of new ADUs, including modifications to requirements for parking, fire sprinkler systems, and water and sewer connection fees. Short term rental (less than 30 days) of ADUs is prohibited. A summary of the City of Sonoma’s regulations for the different types of ADUs is available for download. Details can be found in Sonoma Municipal Code section 19.50.090, Accessory Dwelling Units. As one of the actions taken in response to the 2017 fires in our area, the City Council approved an Accessory Dwelling Unit Fee Waiver Program to further encourage the construction of secondary housing units by single family homeowners. Fee waivers are provided in the form of reimbursement and are limited to one per residence and capped at $5,000. The program will terminate on December 31, 2018, unless extended by the City Council. For more information about building an ADU, contact the Planning Department. What are the types of “Accessory Dwelling Units” or ADUs? See the Accessory Dwelling Unit Requirements. Where are Accessory Dwelling Units allowed? Accessory dwelling units are allowed in the R-HS, R-R, R-L, R-S, R-M, R-H, R-O, and R-P zones. An accessory dwelling unit shall not be located on any parcel already containing a dwelling unit that is non-confirming with respect to land use or density, or developed with a duplex, triplex, apartment, planned development, or condominium. No more than one accessory dwelling unit shall be located on a parcel. An accessory dwelling unit may be within, attached to, or detached from the primary dwelling unit. A detached accessory dwelling unit may take the form of a manufactured home on a permanent foundation. If detached, the accessory dwelling unit shall be separated from the main dwelling unit a minimum of 10 feet. For additional information or to discuss a particular location, contact the Planning Department. Who can live in an Accessory Dwelling Unit? Anyone can live in an accessory dwelling unit, junior accessory dwelling unit, or efficiency dwelling unit. The owner of the property shall reside on the property in either the main or accessory dwelling unit (upon construction). Accessory dwelling units, junior accessory dwelling units, or efficiency dwelling units may be rented for periods of 30 days or more. The rental of an accessory unit for periods of less than 30 days is prohibited. Is an off-street parking space required for an Accessory Dwelling Unit? The City’s municipal code requires that one off-street parking space with an all-weather surface shall be provided for the exclusive use of the ADU, in addition to the parking that is required for the primary dwelling. The parking space for the ADU may be allowed in the driveway and in tandem. However, the parking requirement is waived for certain locations (e.g. if the ADU is located within a designated historic district or within a half mile of a public transit stop), for certain types of ADUs (e.g. when the ADU is part of the existing single-family dwelling or an existing accessory structure) and for ADUs meeting other criteria listed in SMC 19.50.090E. Check with the Planning Department to help determine the requirements for your ADU. Is a building permit required for any type of Accessory Dwelling Unit? Yes, a building permit is required for all proposed dwelling unit types. Fire-Resistive Construction. Pursuant to Section R302of the CA Residential Code as amended by the City of Sonoma, Dwelling units in two-family dwellings shall be separated from each other by wall and floor assemblies having not less than a 1-hour fire-resistance rating where tested in accordance with ASTM E119 or UL 263. Fire-resistance-rated floor/ceiling and wall assemblies shall extend to and be tight against the exterior wall, and wall assemblies shall extend from the foundation to the underside of the roof sheathing. New detached accessory dwelling units when: The primary dwelling on the property has or will have as a result of the current project, an automatic fire sprinkler system installed; OR the detached accessory dwelling unit floor area exceeds 1,200 sq. ft.
New attached accessory dwelling units constructed within or added to an existing primary residence when: The existing primary dwelling on the property already has an automatic fire sprinkler system installed; OR the addition to or alteration of the existing primary dwelling to facilitate the creation of an attached accessory dwelling unit (including the subject ADU project), plus any other building permits issued for the building within any 36 month period, exceeds a total permit valuation of $100,000. For more information about building permit requirements, visit the Building Department page. What are the size and height requirements for Accessory Dwelling Units? Attached accessory dwelling unit. The minimum floor area is 150 s.f. The minimum dimension of any habitable room, except kitchens, is 7 feet in any horizontal direction (CA Residential Code R304.2). The minimum ceiling height shall comply with the CA Residential Code. The maximum size is 30 percent of the existing living area of the main dwelling. Detached accessory dwelling unit. The minimum size is 150 sq. ft. The minimum dimension of any habitable room, except kitchens, is 7 feet in any horizontal direction (CA Residential Code R304.2). The minimum ceiling height shall comply with the CA Residential Code. The maximum floor area is 850 sq. ft. Any detached accessory dwelling unit exceeding 650 sq. ft. shall not exceed 50 percent of the existing living area of the main dwelling. Junior accessory dwelling unit. The minimum size of habitable rooms, except kitchens, is 70 sq. ft. (CA Residential Code R304.1). The minimum dimension of any habitable room, except kitchens, is 7 feet in any horizontal direction (CA Residential Code R304.2). The minimum ceiling height shall comply with the CA Residential Code. The maximum floor area is 500 sq. ft. and all applicable residential zoning district requirements regarding coverage and floor area ration shall be met. Efficiency dwelling unit. The habitable room shall be not less than 150 s.f. of floor area with a minimum horizontal dimension in any direction of 7 feet. Bathrooms, toilet rooms, closets, halls, storage or utility spaces and similar areas are not considered habitable rooms. The minimum dimension of any habitable room, except kitchens, is 7 feet in any horizontal direction (CA Residential Code R304.2). The minimum ceiling height shall comply with the CA Residential Code. The maximum floor area of an efficiency dwelling unit is 500 s.f. Each accessory dwelling unit, junior accessory dwelling unit, and efficiency dwelling unit shall comply with the height limitations established in the zoning district where the structure is located. Detached accessory dwelling units shall be limited to a single story and shall comply with height restrictions for accessory structures. Attached accessory dwelling units shall comply with height restrictions for primary structures. Can I use an Accessory Dwelling Unit as a vacation rental? Accessory dwelling units, junior accessory dwelling units, or efficiency dwelling units may only be rented for periods of 30 days or more. The rental of an accessory unit for periods of less than 30 days is prohibited.